STAMP A STACK OF BIRTHDAYS! It’s great having a card on hand when Birthdays come around – And we all need birthday cards right! In a Stamp A Stack you create 6 cards. We will be making 2 each of 3 designs just right for Birthdays These are just 2 of them. WHEN: Friday Feb 23rd 10am or 7pm. COST: $15 please BYO own adhesives. $5 extra to use mine. 1) Let’s make another time with you and a couple of friends. 2) Order the card kit. $15. Includes card cut to size. You can substitute the stamp sets. 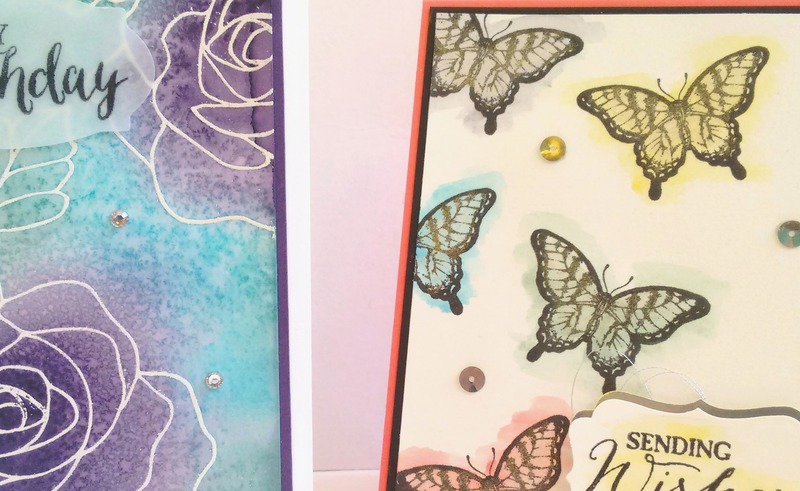 Watercoluring is all the rage in the crafting world, have you noticed? We are focusing on 2 fun watercolouring techniques in our class this Saturday. I hope you can join us. We will make 2 fun cards with different watercolouring techniques. Here is a sneak peek for you. Please RSVP by Thursday 7th. I have had this idea in my head for a while now so I had to just do it!! I wanted to create a little box using the Scallop Tag Topper Punch. I have used the Sale-A-Bration ‘Sweet Sorbet’ DSP. I know Sale-A-Bration is done with BUT I HAD TO USE IT!!! I used the new Spiral Flower Die that has just come in to my possession. I am having fun with that little die 🙂 I have seen the twine loops around the blogosphere and wanted to have a go with making them. It was a bit tricky at first as I didn’t know what I was doing but I think I worked it out in the end. The leaves are from the 2-step Bird Punch. Card – 29.5cm x 21cm. Along the long side score at 7cm, 14cm, 21cm and 28cm. Along the short side, score at 7cm and 14cm. DSP for wrapper – 3.5cm x 29.5cm. Imperial (Finished size for this one will be slightly taller than the Metric box. There is a photo below showing the difference in size). Card – 8 ½” x 11”. Along the long side score at 2 ½”, 5”, 7 ½” and 10”. (Trim ½” off on the small tab section so there is not so much excess to adhere down). Along the short side, score at 2 ½” x 6”. DSP for wrapper – 1 ¼” x 11”. DIRECTIONS TO ASSEMBLE THE BOX FOR BOTH METRIC AND IMPERIAL. 1. After you have cut your card to size and scored it. Cut off the small tabs, one at the top and one at the bottom leaving the middle section. 2. Punch out each tab on the long side using the Scallop Tag Topper Punch. To do this slide the first scored section into the Punch. You will need to wiggle it gently in under the punch. Centre it in the punch. I line up the card section between the rectangle on the top of the punch and then punch. 3. Gently slide the card along to the next scored section. Line it up in the same way and punch out again. Repeat this for the next 2 sections. Trim off the excess card between each punched section. 4. Cut up each score line at the bottom until it meets the horizontal score line. 5. Fold on each of the score lines. Fold over the top Scalloped section and adhere down with Sticky Strip. 6. Add Sticky Strip to the small tab at the side on the right side of the card. 7. Assemble by folding the scored lines in to form a box shape and adhere together onto the side tab. 8. Add Sticky Strip to the bottom tabs and adhere down. 9. Adhere the Wrapper around the box and decorate as you would like. I made another version using DSP (Sweet Sorbet again!). This one was using the Imperial measurements. This is slightly larger than the Metric version. You can see them in the photo together below. HIP, HIP, HOORAY BANNER BLAST! I love the stamp set you get with the ‘Hip, Hip, Hooray’ card kit. 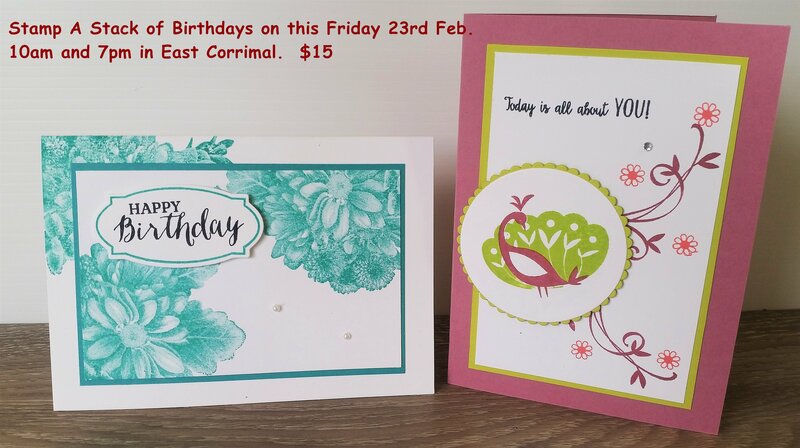 This is awesome value at $34.95 which includes the cards, envelopes, stamps, inkspot and embellishments enough to make 20 cards. You can see all the details in this post here. Here is a card I made with the stamp set and using the set ‘Banner Blast’ that you can get for Free as one of your Sale-A-Bration choices. This also uses the ‘Hardwood’ stamp from the Occasions Catalogue. The card was inspired by a card I saw on Pinterest. This is one of the cards we will be making at my card classes on Friday. I still have some places left if you want to join me and you are in the area. I would love to see you at 10am or 7.30pm. Cost is $15 but you need to let me know ASAP so you don’t miss out. I have been playing with some new goodies. You are going to love some of these new products coming out in the new Occasions catalogue. The dilemma was what to play with first! I did play around with some of the other stamps but thought I would show you this card first. This stamp is from the stamp set ‘Happy Watercolor’ that will be out soon. It has some great images. You know the great thing about this set is that if you find watercolouring difficult this makes it so easy. In the set are a couple of “splodges” if you like to call them that and you can just stamp over the image to create a watercolour wash. No need for detailed watercolouring although you can still do that if you choose. Too easy!!! Doesn’t this make you think of Ice-Cream??? LOL Maybe it’s just the heat getting to me! I have also used the new Scalloped Tag Topper Punch. You can create tags any length you like. Plus check out the Embossed Background. This is using the Decorative Dots Embossing Folder that you will be able to choose for Free during Sale-A-Bration! How cool is it!! Colours used are Pistachio Pudding and Baked Brown Sugar. I have just added a Linen Thread bow to finish it off and the greeting is from ‘Remembering Your Birthday’. This is one of the cards you will be able to make at my ‘Upcoming Birthday Card Buffet’. All the details you can find in this post here. It is on February 8th. Places are booking out fast so if you want to join us you better book in quickly. Thanks for visiting. Hope you are surviving the extreme weather conditions wherever you are. In Australia we are having heatwaves but I have heard of all the extreme storms and cold in the UK and the US. Stay safe! One of my Nephew’s recently graduated from University so I wanted to make a card congratulating him. I didn’t think I had a ‘Grad’ stamp but then I remembered the Blue Ribbon stamp set. It is a hard to tell by the photo but I clear embossed the ‘Congrats Grad’ after I stamped it in Black. So it has a nice shine to it. This was punched out with the 1 3/8″ circle. The Scallop was stamped in Pacific Point and punched out with the 2 3/8″ Scallop Circle. The tail outlines were stamped in Pacific Point and then I stamped the words over it with Black. The Whisper White card was embossed with the Chevron Embossing Folder. This was layered on a Basic Black mat and then a Pacific Point card base. I have added some Black Taffeta ribbon. It doesn’t hurt to add a little bling on a boy’s card either does it??? Thanks for stopping by today. I hope you can visit me again soon. The dress is made from 2 Tea Lace Paper Doilies. I found the idea for the folding on Becky’s blog. I thought I could show you the folding but why not stop by Becky’s blog here and you can check it out! I tied around some Island Indigo satin ribbon from Sale-A-Bration. I have layered the dress on a piece of Island Indigo card that I ran through the Big Shot with the Vine Embossing Folder. The bottom edge was cut with the Adorning Accents Edgelits. I stamped the greeting in Island Indigo using the Curly Cute stampset. If you want to get hold of this set you better be quick. You only have just over a week and it will be GONE!!!! I’m glad I can finally show you this card. I think it was well-received??? ?